The attackers were supporting Maduro against opposition demands for elections to remove him from office. Government supporters burst into Venezuela’s opposition-controlled congress on Wednesday, witnesses said, attacking lawmakers and journalists in the latest flare-up of violence during a political crisis. Hours afterwards by late afternoon, a crowd of roughly 100 people was still besieging the building, trapping people inside, witnesses said. Several dozen people ran past the gates with pipes, sticks and stones and went on the attack. They injured at many opposition lawmakers who stumbled bloodied and dazed around the assembly’s corridors, witnesses said. Venezuela’s opposition is demanding general elections to end socialist rule and solutions to the OPEC nation’s brutal economic crisis. The government says its foes are seeking a violent coup with U.S. support. 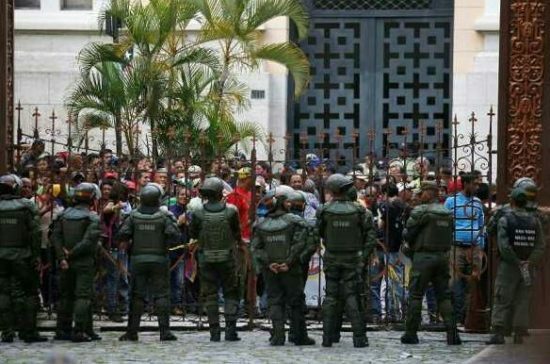 Enemy at the gates: This picture shows Government supporters stand outside the gates of the National Assembly as they besiege the building, preventing people on the inside from leaving, in Caracas. 0 Response to "Protesters Storms Venezuela National Assembly; Beat Politicians To Pulp (Photos)"